oh, sweet joy! : oops. a bit of a delay. Merry Christmas from the Davis'! These were supposed to be my Christmas cards. I didn't like them enough to send. oopsies. 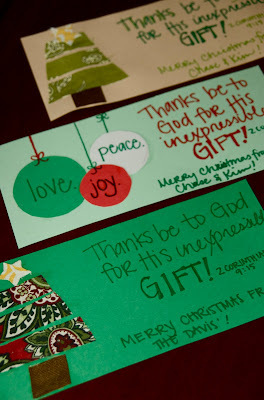 They'll end up as tags on some gifts. I hope your day was filled with love, family, friends, good food, good fellowship, and memorable celebration of the birth of our Savior, Jesus. Heck, maybe even a happy birthday, Jesus cake??? focusing on this verse today despite the commercialism and materialism that has become Christmas. 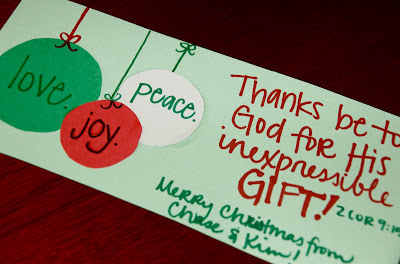 God is good and his gift to us is truly, inexpressible.